The mobile revolution is affecting every part of life: from music, to computing, to photography. And very soon, the millions of Americans who own mobile phones will no longer need their old leather wallets either. All of the credit cards, offers, loyalty, and gift cards those wallets hold will migrate to their devices. 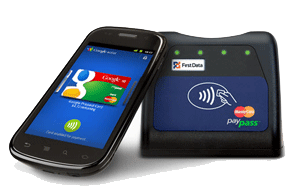 First Data has partnered with Google to make Google Wallet a fast, easy, and safe way to pay. Millions of people can tap, pay, and save as they check out at stores like yours, equipped to accept Google Wallet. So join the movement and give people what they want. …all of which drives more traffic through your doors. Google Wallet couldn’t be easier to accept. Your team member rings up a purchase, asks “Cash, credit or Google Wallet?”, and may have to push the terminal’s credit button. The customer enters a PIN on the phone, taps the terminal’s reader with their phone…and that’s it. Done. No change, no hassles. Whether one card or twenty, Google Wallet creates digital versions of credit cards and stores them neatly on consumers’ phones. A Google Wallet enabled phone includes a secure chip and a radio frequency antenna (aka NFC or Near Field Communications). When the phone is tapped against a contactless reader, the phone transmits payment details wirelessly, the consumer receives verification, and no card ever gets swiped. Google Wallet works on a variety of contactless readers, including the First Data FD-30 and FD-20 models. The FD-30 reader offers the most comprehensive solution with a PIN pad that accepts traditional payment forms as well as Google Wallet, MasterCard® PayPass®, and other contactless transactions. 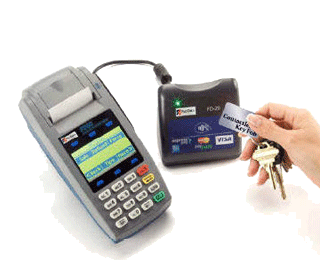 Customers wave their mobile phone or card over a PIN pad rather than swipe a card. To accept payments using Google Wallet, you need to use the FD-20 Terminal.